Had an accident during a holiday and looking to make a holiday compensation claim? Did your accident happen abroad whilst on a package holiday? Are you looking for holiday accident compensation specialists who accept personal injury claims on a no win no fee basis? When you book a package holiday through a tour operator your holiday is protected by the Package Travel Regulations 1992. If something goes wrong during your holiday, and it is due to the fault of, for example, the hotel, then your tour operator is responsible. So, if you were injured in an accident abroad and your injury was caused by the negligence of the hotel, you are entitled to claim compensation from your Uk holiday company. If, for example, you have slipped and fallen at a hotel because the floor had been mopped and there were no warning signs displayed, then this is an accident for which, if you have suffered an injury, you can make a claim compensation for. The amount of compensation you can claim depends on the extent of your personal injury and how much money it has cost you to prove the accident was caused by someone else’s fault. Mr John Smith of Manchester tripped on a broken staircase at a hotel in Spain and suffered a broken Shoulder. Mr Smith’s holiday was ruined and he could not return to his work for 3 months as a builder. Because he had purchased a package holiday, he was able to pursue a compensation claim in the courts of England and Wales. Had an Accident Whilst Abroad on Holiday? 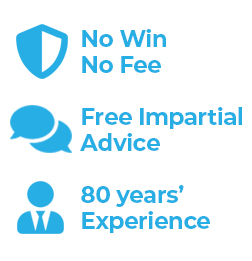 Speak to a Holiday Compensation Expert at Simpson Millar Solicitors today for free advice. Whether the accident happened at a hotel or on-board a cruise ship or airplane, if you sustained an injury and someone else was to blame, you may have a claim. Mrs T sustained an injury on holiday, when a chair she was sat on slipped backwards and off a raised platform at a hotel. Our Holiday Accident Specialists were able to establish that the chair was badly positioned by the hotel and that Mrs T’s accident was foreseeable. Call our friendly and experienced Holiday Accident Compensation Lawyers for a no obligation, FREE assessment of your package holiday accident compensation claim. Get open and honest advice about making a claim for compensation and find out just how much holiday compensation you may be entitled to claim.